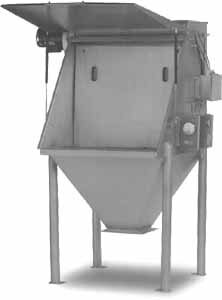 A bag dump is used to unload bags of dry ingredients and move product directly into the pneumatic conveying line or other processes with ease and efficiency. Features of the unique design include a hopper without dead spaces or corners and a gas spring assisted door that makes unloading easy. In addition, cartridge replacement is fast and simple thanks to the patent-pending, air-actuated cartridge filter sealing mechanism which is not exposed to the material contact area.